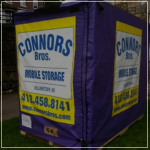 Per-Item Summer Storage - Connors Bros.
An item is considered to be any loose article, such as a box, bag, or piece of furniture. There is a weight limit to prevent over packing: one person must be able to lift each item. All items must be labeled with the student’s last name and the total number of items stored. *Large items like mattresses and sofas are flat rated- inquire to find out specific pricing. Self-Haul: For no charge you can bring your items to our office. We accept drop offs Monday–Friday 9:00 AM-3:00 PM. Curb Deliveries: We will pick up your items curbside from your dorm for $40.00 on weekdays. Room Deliveries: We will pick up your items from your dorm room for $100.00 on weekdays. Special Weekend Hours: On Saturday May 19th, we will be doing curb or room pick ups between 10:00 AM – NOON. The cost for a curb pick up is $60.00 and a room pick up is $150.00 on the weekend. Our office will then be open for self-haul drop offs from NOON – 2:00 PM. Free Deliveries: We will pick up your items free of charge at the following locations and times on Friday, May 18 and Tuesday, May 22.